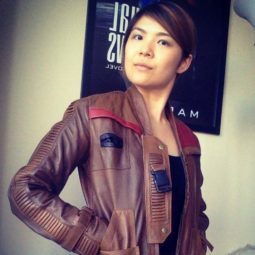 Mary Fan and I are both science fiction authors and Star Wars nerds, but as we’re 20 years apart in age (Mary the youthful spitfire here – ha! 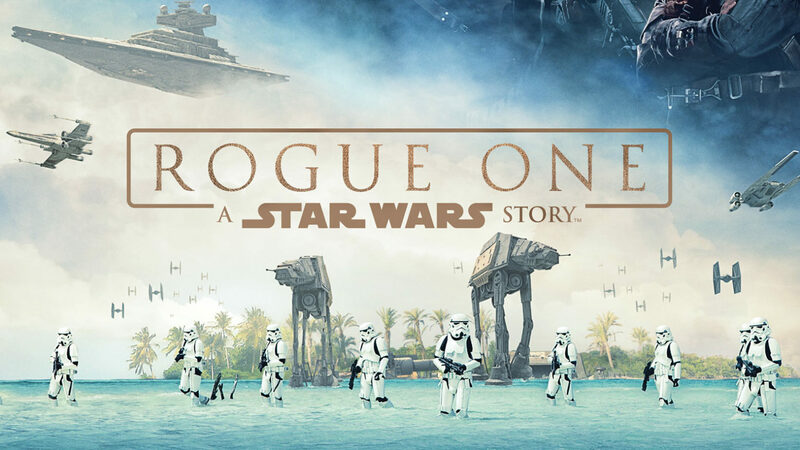 ), we thought it would be fun to chat about Rogue One, see where we agreed, where we disagreed, and where this newest Star Wars movie fits on the list of our favorites. FAIR WARNING – SPOILERS THROUGHOUT! Russ: Mary. We’ve both seen Rogue One. What did you think? Mary: I really liked it!! I loved seeing new parts of the Star Wars universe. And they all fit perfectly into the world of the originals… It was pretty stunning how much Rogue One ‘felt’ like an extension of those movies (unlike the prequels—which I also liked, but whose shininess always clashed with the rundown universe we love). I also really loved the new characters. 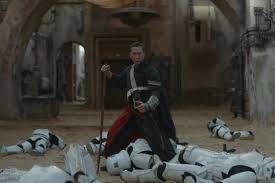 Chirrut was my favorite, with his blend of dry humor and spiritual idealism. And I loved his interactions with Baze. I also really liked Jyn. She’s an interesting character, and it was great seeing a flawed and amoral woman lead a film. And of course the action was thrilling (I could go on). That being said, I didn’t LOVE love it as much as I did The Force Awakens, which had more of the Star Wars spirit. Star Wars has always been about hope and idealism (in the fairytale mold). 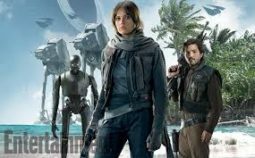 Rogue One talks about hope a lot, but doesn’t offer much at the end. And I’m not a fan of the Rogue One soundtrack… Apparently the composer was only given four weeks to knock off John Williams (and you can tell). 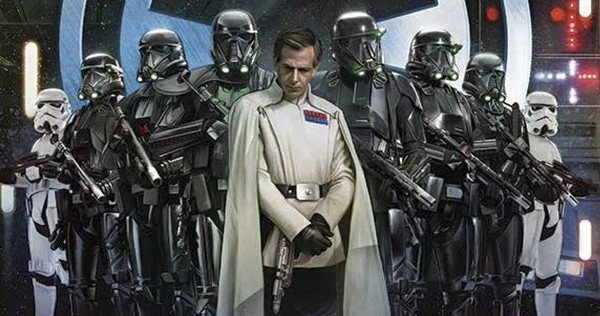 Still, Rogue One is a really well made film (with some awesome acting and cinematography) and a great addition to the Star Wars film canon. What did you think? Russ: I actually loved it. It has its flaws, but the intensity drew me in all the way to the final frame. But it’s interesting to me that you said it didn’t have hope. Yes, the characters in Rogue One don’t live to fight another day, but they sacrificed themselves for the greater good. Heartbreaking, but I would argue that their sacrifices paved the way for hope. There was a sense of desperation that we haven’t seen since Empire, and parts of Revenge of the Sith. Now about the music … it was actually my biggest complaint. 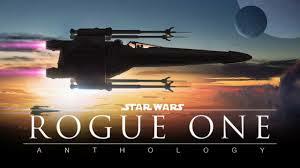 No matter the reasoning behind it, to me, it’s not a complete Star Wars movie without the classic soundtrack. What the filmmakers offered us was a poor knockoff. There were specific beats in the story that were perfectly queued up for the classic music to kick in, and it was a dud when that music wasn’t there. But getting back to Jyn. You said she was amoral. How so? I didn’t really see her that way. Disillusioned, yes. But I saw her as waiting to be, pardon the pun, awakened. Mary: Sorry, I thought we were doing spoiler-free, so I didn’t elaborate. But if we’re talking about the ending… Yes, there ultimately is hope for the rebellion. But not for the characters themselves. Rogue One is ultimately a tragedy, and really, this is the first time Star Wars has been tragic. Even with Episode 3… You knew Anakin was going to be redeemed. Jyn, Chirrut, Cassian, etc… They’re just gone. I didn’t mind how it ended — I thought it worked for the movie — but it didn’t feel very Star Wars-y. Music: I completely agree. I think it would have been better off if it hadn’t tantalized us with brief glimpses at the original music that wandered off in different directions. Like the theme music over the opening title… It opens with a perfect fifth jump just like the Star Wars main theme, but then gives us different notes, which is just a huge let down. Anyway, enough music nerding for me! RE Jyn: When we meet Jyn, she’s neither good nor evil. She’s just out for herself, which is perfectly understandable. She doesn’t believe in the rebellion… The empire planting their flags everywhere is “not a problem if you don’t look up.” She’s like Han Solo… He’s amoral when we meet him and doesn’t become good until he saves Luke at the very end. In RPG terms, I see Jyn as chaotic neutral. Of course, like Han, she makes the leap to chaotic good at the end, when she sacrifices herself for the greater good. I loved that character arc for her. Women in SFF are almost always portrayed as either good or evil, period. They’re not allowed to inhabit that gray area of characters like Han. They’re not allowed to be a bit unlikable, yet still the hero. Jyn was groundbreaking in that sense. Russ: I agree with that. Jyn was given the chance to have a significant yet tragic arc that had some weight to it. Mary: Yes!! I loved Vader’s role. 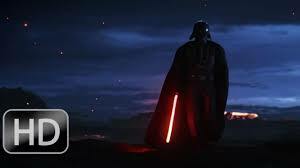 That was the badass Vader I always wanted to see… Vader at the height of his evil power. We don’t really see that in the originals, and I think it’s just because of the technology of the time. Now, we understand why he’s so feared, why those Rebels looked so terrified at the beginning of A New Hope. Speaking of OT characters, what did you thing of CGI Tarkin? Russ: Mixed feelings. The performance was really good, with the same understated, cold-hearted delivery as Peter Cushing in New Hope. But … the technology isn’t totally there yet. He looked just ‘fake’ enough where it felt a bit creepy. Also … what did u think about Krennic? Ben Mendelsohn is a good actor, and I’d love to see the footage of him that they cut from the movie, but I didn’t really fear him as much as he was just an ambitious weasel. Mary: Krennic? He was all right. He wasn’t scary so much as a representative of a larger evil… Really, he was a high-ranking thug. Which I didn’t mind, to be honest. Vader and Tarkin were the ultimate villains, even though they had less screen time. I wish they hadn’t gotten so cocky with their CGI, though. If they’d only used transmissions/holograms, even full body shots, they could have gotten away with it. But the close-ups looked plastic to me. Good plastic, but plastic nonetheless. The performance by the actor behind the CGI was well done, though. CGI Leia worked because she’s only seen for an instant. Also, it’s a lot easier to CGI a pretty teen with smooth skin LOL. Also, how thrilling was it to see the original rebel pilots? Russ: Absolutely! I loved those original pilots! So cool! And one of my favorite nerd moments was learning that the same crystals that powered the light sabers were being mined to power the Death Star. Great use of duality — a physical embodiment of dark vs. light theme. Mary: Yes! That’s going to be an iconic line… almost as iconic as “May the Force be with you.” I’ve seen people quoting it already. 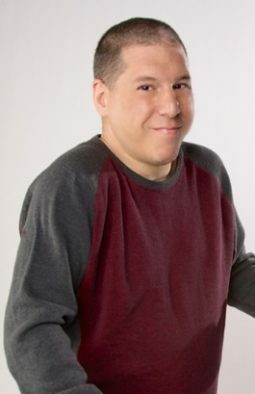 I loved everything about his character. Though now, having seen a real martial arts master in action in the Star Wars universe, suddenly all the Jedi look like actors with sticks! Which is hilarious because Chirrut isn’t a Jedi — despite several articles mistakenly calling him one. What are your thoughts on K2? Everyone kept praising Alan Tudyk’s performance, but it mostly fell flat for me. Some moments were funny, but most of the quips felt forced, like he was trying too hard to be the comic relief. Russ: Yeah … I wasn’t blown away. Not great, not terrible. So …. we’ve kicked around Rogue One. How would you rate it compared with Force Awakens? Mary: It’s hard to compare the two since they’re such different movies. Overall, I liked The Force Awakens more, but that’s not because it was necessarily ‘better’ than Rogue One. Breaking it down, Rogue One wins for originality, The Force Awakens wins for enjoyability and that special Star Wars ‘something’ (and for soundtrack). I also liked the characters of The Force Awakens more… I think it’s because there are fewer of them, and so we get to know each a little better. Russ: I had really mixed feelings about Force Awakens. There were great nerd moments, like the first time we saw the Millennium Falcon, Han and Chewy, R2D2 and C3PO. I was cheering and fist pumping! There were some great action sequences, and for my money, Rey is one of the very best characters in the entire franchise. She’s tremendous. And yet … Force Awakens was, essentially, a remake of Star Wars, where they blow up the Death Star. Again. And Snoke? Meh. Pretty much just Golem with a throne instead of a ring. The movie looked great, but it lacked originality. 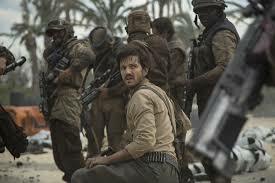 Whereas Rogue One, I agree, didn’t have the same ‘magic’ as we might call a classic Star Wars movie, but to me it felt much more urgent, intense, and original. And given that Rogue One ends literally seconds before A New Hope begins, I’m really interested in watching them both back to back. It feels like it’ll give A New Hope an entirely different feel. So all in all, for me, Rogue One was the far superior movie, even though it has its flaws. Stay tuned for Part II of this chat, where Mary and I rank our favorite Star Wars movies! Mary Fan is a sci-fi/fantasy writer hailing from Jersey City, NJ. She is the author of the Jane Colt sci-fi series, which comprises ARTIFICIAL ABSOLUTES (Red Adept Publishing, 2013), SYNTHETIC ILLUSIONS (Red Adept Publishing, 2014), and VIRTUAL SHADOWS. Her works also include several young adult fantasy novellas: THE FIREDRAGON (Glass House Press, 2014), FIREDRAGON RISING (Glass House Press, 2015), TELL ME MY NAME (Glass House Press, 2014), and LET ME FLY FREE (Glass House Press, 2016). These serve as prequels to two full-length series currently under contract with Glass House Press, Flynn Nightsider and Fated Stars. Find her online at www.maryfan.com, on Twitter as @astralcolt, and on Facebook at www.facebook.com/mfanwriter. Fun Gift Ideas – Regift It!